The red tailed hawk, also known as the redtail hawk, belongs to the order Falconiformes, and family Accipitridae. The red tailed hawk belongs to the genus Buteo. Its Latin name is Buteo jamaicensis. The red tailed hawk's height reaches an average of twenty-two inches and the wingspan may reach up to fifty-four inches. The red tail's name comes from its rust red tail. Other distinguishing features are its dark wing tips, brown wing and head feathers and white or golden brown chest and belly. Care should be taken not to confuse them with the Ferruginous, Rough Legged, Broad WInged, Swainson's, and juvenile Harris' hawks. Like many other birds of prey, the female is much larger than the male, and like all raptors it has a sharp hooked beak for tearing flesh. The red tailed hawk lives in the woodlands of north and central America. It is the most widespread and familiar member of the American Buteos (large soaring hawks). They nest in the month of March in tall tress. Like all other Buteos, it does not fly fast but soars at high altitudes using its keen eyesight to spot the slightest movement in the grass below. Like all hawks, its talons are its main weapon. It hunts for live prey but also eats carrion. The main animals the red tailed hawk hunts are snakes, small birds, and other small land animals including frogs, small rodents, rabbits, and lizards. A good life span for red tailed hawks is ten years, but they can live up to twenty-one years. The average weight of the female is only three pounds or less! With few exceptions, red tailed hawks are monogamous (breeding in one pair for life). The number of eggs depends on the size, age, and strength of the male and female. The stronger and healthier the male is, the more food he can supply. This means that the eggs will be stronger and more plentiful. The average number of eggs is two to three. The incubation period is one month. When the chicks hatch they are totally naked of feathers. In six to seven weeks they are ready to leave the nest, and they are ready to fly. They will hunt with their parents and fly as a family unit for four to five months before they are on their own. The eyesight of a hawk is eight times as powerful as a human's. If a hawk could read, it could read a newspaper from seven stories high, or see a mouse in a field a mile away, but, the reason hawks crash into fences is they are far sighted. Many factors have impacted the red tailed hawk and other raptors. Man's encroachment on feeding grounds has seriously impacted most wildlife including hawks. 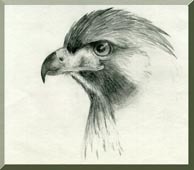 Hunters once regarded red tailed hawks, as well as many other raptors, as competitors for game. Ranchers and herders thought hawks would ruin their livelihood by feeding on their livestock. Insecticides and poisons such as DDT weakened eggs. Power poles, glass windows, electric and barbed wire fences, and just plain human curiosity are also negative impacts on hawks. Laws controlling insecticides, federal laws protecting raptors and public education have helped to limit or eliminate some of the detrimental influences on the red tailed hawk, but much work is still to be done. In some cultures such as the Native American culture, hawks and eagles are considered sacred. Hawks are symbols of spirit, wisdom and power. Even their feathers and talons have a special meaning in ceremonies and ceremonial dress. The Migratory Bird Treaty Act, The Bald Eagle Protection Act and The Endangered Species Act protect the taking or possession of any part of a raptor except for special circumstances including ceremonial use by Native Americans (see items below). Wherever they are seen by humans, hawks and eagles are greatly admired for their strength and beauty in flight. The Migratory Bird Treaty Act makes it unlawful for anyone to kill, capture, collect, possess, buy, sell, trade, ship, import, or export any migratory bird, including feathers, parts, nests, or eggs. The Bald Eagle Protection Act prohibits all commercial activities and some non-commercial activities involving Bald or Golden eagles, including their feathers or parts. The Endangered Species Act makes it illegal to sell, harm, harass, possess or remove protected animals from the wild. Violations of the Migratory Bird Treaty Act, Eagle Protection Act, and Endangered Species Act are considered criminal offenses and can result in significant fines and imprisonment. In some cases, a conviction might also result in the forfeiture of equipment (vehicles, boats, airplanes, weapons, etc.) used during the commission of the crime. Native Americans may obtain permits to possess eagles, eagle parts, and other migratory bird feathers for use in religious ceremonies. The National Eagle Repository near Denver, Colorado, serves as the central location for all dead eagles acquired by the Service. Eagle parts are distributed from the repository to Native American permit holders according to the available supply and in order of receipt of request.